Have you followed OCÓO’s road trip into New York City? With summer days slowly coming, refreshing drinks are a must. The team OCÓO knows that and went down on the streets to quench New Yorkers’ thirst. See the first photos souvenirs from our trip. OCÓO is the deliciously fruity Beauty Drink designed to enhance your beauty from within. The positive effects of the ingredients have been proven by extensive studies. OCÓO contains red and blue carefully selected Beauty Berries – a mixture high in antioxidants with an exceptionally unique refreshing taste. The Beauty Berries are characterized by their high content of antioxidants and flavonoids specifically selected for your skin, hair and nails. No preservatives. NO added sugar. Only 48 calories per bottle. A fresh and delicious berry taste! Curated and distributed by The Leading Salons of the World and available on the Beautique. Enter the voucher code SPRING and get a 20% discount on your first order HERE. For additional information: OCÓO official website. 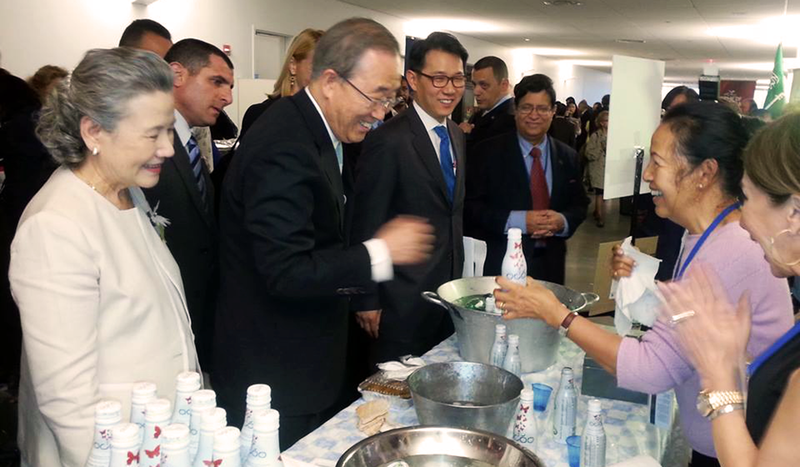 UN Secretary General, Mr. & Mrs. Ban Ki-moon are enjoying OCÓO too!